I've been tagged by TangledFrog and I'll need some time to think it over. 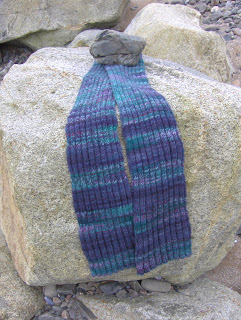 In the meantime I can show you some photos of a scarf I finished for J in January. It has been finished for a couple of weeks but the weather has been a bit too wild to try to photograph it in the daylight. 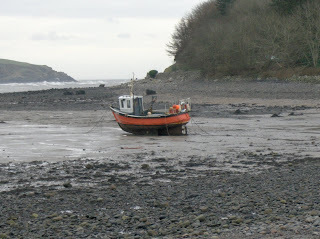 Even in these shots you can see it has been anchored down by some pretty hefty stones. 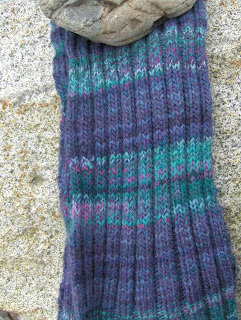 This was a nice easy knit and the colour-changes made it just interesting enough. 20 rows Twilleys Freedom Spirit, 18 Sirdar Peru, 16 Twilleys etc. The whole middle third was done in the Twilleys 513 which is a variegated turquoise colour. I don't think I'll be rushing to use the Sirdar Peru again, but I've continued to enjoy the Twilleys on this project. In other news, I've been trying to do a major clear-out and tidy up. I've got lots of lovely things at home and I want to be able to reach them to enjoy them, so if I don't know it to be useful or believe it to be beautiful (includes sentimental appeal) it has to go. Five bin bags to charity this weekend and still plenty ahead to tackle. Ah , its finally finished and looking good - someone will appreciate it in this weather ! Love the colours in the scarf! I'm envious of your motivation for a major clear out...need to gear up for that myself. Lovely scarf and scenery of course. I have left something on my blog for you!